Style of advising: My approach to each student depends on the student's individual needs and preferences. I typically meet with each student once a week, but I am willing and able to meet more often if the student requires extra help, especially early in the process. I prefer not to go for long periods of time without meeting with the student in order to make sure that things are running smoothly. Initially, I give most of my students a problem that I have thought through to a certain extent and believe it can be solved in a reasonable time frame. The second problem tends to be considerably harder, and so on. As the student progresses, he or she is expected to show more and more independence in the problem selection. When the student is close to graduating, I make an utmost effort to help them find a job, either in academia or industry, depending on the student's preferences. Some of my student's are co-advised with my colleagues, especially in cases when they work on problems involving several areas of mathematics. For example, I co-advised several students with Jonathan Pakianathan and I am currently co-advising a student (Nik Chatzikonstantinou) with Sevak Mkrtchyan. 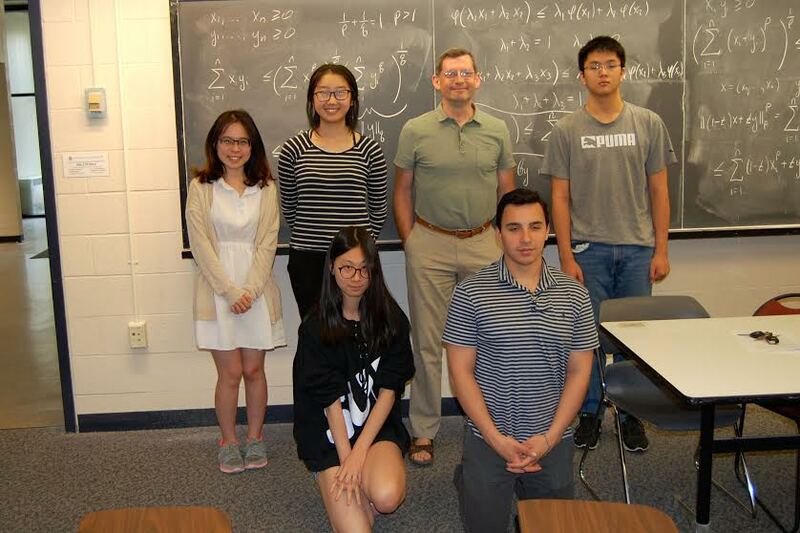 Contact suggestions: If you would like to discuss the possibility of becoming my Ph.D. student or anything else, please feel free to stop by my office (Hylan 909), or email me at iosevich@math.rochester.edu or iosevich@gmail.com. Problems you can expect to work on: I work on problems at the sticking points of harmonic analysis, combinatorics and number theory. I also have an interest in applied data science. If you want to work with me, there are four main options and some combinations thereof. One option is harmonic analysis with an emphasis on configuration problems in geometric measure theory. The basic question there is, how large does a set in Euclidean space (or a Riemannian manifold) need to be to ensure that it contains vertices of a geometric configuration such as an equilateral triangle, an angle of a given size, or a chain of a given length. A combination of Fourier analytic and combinatorial methods play an important role. The key problem in this area is the Falconer distance conjecture which says that if the Hausdorff dimension of a compact set is half the ambient dimension, then the Lebesgue measure of the set of pairwise distances is positive. Among the Ph.D. students who worked or are working with me in this area are Nik Chatzikonstantinou (current Ph.D. student at UR), Bochen Liu (postdoctoral researcher, Chinese University in Hong-Kong), Steven Senger (Assistant Professor at the University of Missouri), Belmiro da Silva (current Ph.D. student at UR), Krystal Taylor (Assistant Professor, Ohio State), Brianna Vick (current Ph.D. student at UR). Another option is a set of similar problems in vector spaces over finite fields or in modules over commutative rings. While there is some overlap between the techniques involved in the two disciplines, the problems in the finite field setting have a non-trivial arithmetic component which frequently gives the problems a distinct flavor. In this setting we ask how large a subset of the d-dimensional vector space over a finite field needs to be to ensure that it contains vertices of an equilateral simplex or another geometric structure. Another key question is the sum-product question which asks for the smallest possible size of minimum of the sum set and the product set of a subset of a given finite field. Among the Ph.D. students who worked with me in this area Esen Aksoy (postdoctoral research at the University of Ankara), Philipp Birklbauer (current Ph.D. student at UR), Jeremy Chapman (Associate Professor at the Lyons College), David Covert (Assistant Professor at the University of Missouri-St. Louis), Doowon Koh (Associate Professor at Chungbuk University), Alex McDonald (current Ph.D. student at UR), Brendan Murphy (postdoctoral researcher at the University of Bristol), Steven Senger (Assistant Professor at Missouri State University), Le Anh Vinh (Professor at the University of Hanoi). In the discrete setting, the key problem is the Erdos distance conjecture, which asks for the minimal number of the pairwise distances determined by the elements of a finite subset of a d-dimensional vector space over the real numbers. This conjecture was resolved in two dimension in 2011 by Larry Guth and Nets Katz, but the higher dimensional case remains wide open. The sum-product phenomenon described above is very much alive and well in this setting as well. Among the Ph.D. students who worked or are working with me in this area are Steven Senger (Associate Professor at Missouri State), Jonathan Passant (current Ph.D. student at UR) and Firdavs Rakhmonov (current Ph.D. student at UR). Last, but not least, there is also an option of working with me on problems in applied data science. While I have not yet advised a student in this area, I have several interesting problems in clustering and dimension detection of large data sets that I would like to explore with a student in the near future. The complete list of my current and former Ph.D. students can be found in my CV. You can find links to all of my publicans, both recent and not so recent, as well as the list of the invited lectures I have given over the years in my CV as well. There is a number of other recent papers in this direction, but these will an idea of what is going on. It is important to note that a substantial number of the papers mentioned above and other papers that I have written can be put in multiple categories. If you become my student, you will hear exclamations about the unity of mathematics all the time!